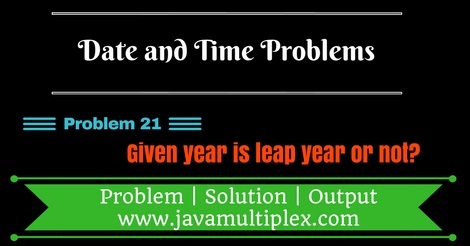 Home Basic Date Questions How to check whether given year is leap year or not in Java? Write a program in Java that checks whether given year is leap year or not with proper validations. Year is leap year or not? A leap year is a year containing one additional day. Leap year has 366 days. If any year satisfies any one of following two conditions than we can say that year is a leap year. It is evenly divisible by 4 but not 100. It is evenly divisible by 400. Examples : 2000,2004, 2008 etc. * @problem Year is leap year or not? * Year is called leap year if. * 1) It is evenly divisible by 4 and not by 100. * 2) It is evenly divisible by 400. // Regular expression that matches a String contains 4 digits. // Converting String to int. Output - Given year is not leap year. Output - Given year is leap year. Tags : Date and Time problems, Leap year, Solution in Java, String, Regular expressions, if else statement.